Heavily saturated wet wipe neutralizes static and removes dust, dirt and oil. 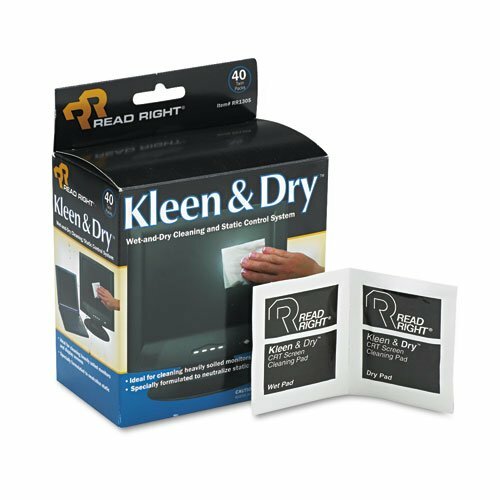 Strong, dry, absorbent cloth dries and polishes screen to streak-free clarity. Ideal for large or heavily soiled computer and display screens, TVs and more. Not for use on nylon mesh/polarized antiglare screens. Twin pack, dry and wet screen cleaners. Heavily saturated wet wipe neutralizes static and removes dust, dirt and oil. Strong, dry, absorbent cloth dries and polishes screen to streak-free clarity. Ideal for large or heavily soiled computer and display screens, TVs and more. Not for use on nylon mesh/polarized antiglare screens.